The Siberian tiger - Panthera Tigris Altaica - also known as the Amur tiger. They are found in the in the Russian Far East – Siberia – Hence the name. Known to have a much colder climate the Siberian Tiger have adaptations that enable them to withstand this colder climate. They have a thicker layer of fat and dense fur. They are paler and with less stripes than Bengal Tigers. Its stripes are narrower and spaced further apart. Its chest, belly and inner parts of its limbs are white. An interesting fact is that the skin has stripes and even if you would shave all the fur off a tiger, the stripes will still be visible. A dead give-away between the Bengals and the Siberians is to look at the amount of fur around the neck. The Siberian Tigers have thicker fur around the neck. 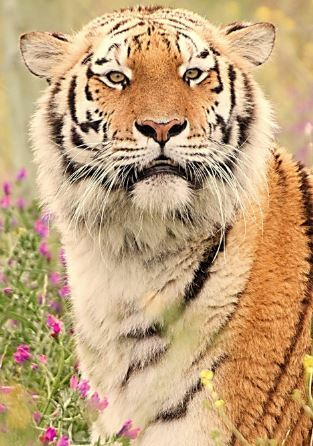 The Siberian Tiger is the largest cat species in the world. In the wild and when needed the Siberian Tiger can jump to a height of 5 meters and a length of 10m. Exceptionally strong, they can run whilst holding prey of up to 100 kilograms in their mouths. The existence of White Siberian Tigers has not been documented. With an estimate of about 500 odd Siberian tigers living in the wild, there are probably more Siberian tigers living in captivity than what there are in the wild. For tigers, hunting is not instinctive it is a skill learnt from their mothers.